Keyblades are weapons the protagonist of Kingdom Hearts 3 uses. They can transform, and each of the dozen or so keyblades will affect your stats differently, and give you access to different abilities. If you’re wondering how many of them are there, what their stats and abilities look like or how to get them, keep reading our Kingdom Hearts 3 All Keyblades guide. How many keyblades in Kingdom Hearts 3? There are 15 keyblades in KH3. Three of those are exclusive preorder bonuses – one on Xbox, one on Playstation 4 and one on Amazon – and one is the default one. This means you’ll have the chance to collect 11 Disney-themed keyweapons during your time with the game. Each one has its distinct pros and cons, but some are clearly better than the others. For more info about how we rank them, check out our KH3 best keyblades guide. Kingdom Key is your default keyblade. Sora will have it from the start, and it’s the weakest weapon in the game. It increases your strength by 4 and your magic by 3, and comes with the treasure magnet ability. However, you might end up using it for the first several hours regardless, as it does some stuff better than the early ones you’ll find. 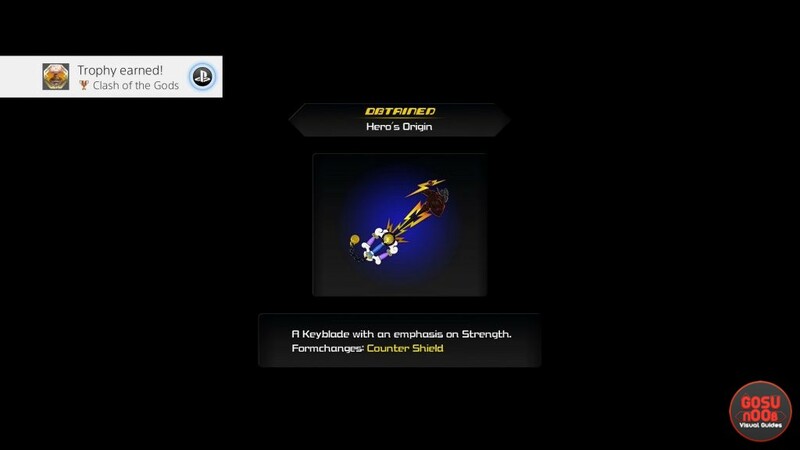 Hero’s Origin is the first keyblade you’ll earn, and it is unlocked by completing Olympus. Help Hercules in Thebes and Mount Olympus, and you’ll end up with this sweet, thunder-adorned keyblade that adds 5 strength and 2 magic, and unlocks the defender ability. It’s a great choice for any warrior character, but not so much for magic users. Shooting Star is a weapon that literally looks like a shooting star, tail and all. You’ll get it by completing the Twilight Town portion of the story. It has the magic treasure magnet ability, and it increases your magic by 5, but your strength by only two. If you’re playing a mystic, you’ll probably want to use it, but if you’re a fighter, you’ll probably ignore it. Favorite Deputy is obtained by helping everyone’s favorite sheriff – Woody – in the Toy Box world. After you’ve completed his and Buzz’s portion of the story, you’ll get this keyblade, which gives you the lucky strike skill, and bumps up your strength by 6 and your magic by 3. This is the first weapon that outmatches the default one in every category. Ever After is a lance with a sun symbol at the top, which probably makes it kinda inefficient. No worries though – its strong suit is magic, not close combat. It’ll increase your magic by 7, and your strength by a mere 2. It’ll also unlock the leaf bracer ability. To get it, you’ll need to complete the Kingdom of Corona. Once you’ve completed Monstropolis, you’ll get the Happy Gear keyblade. It’s not a McDonalds pun, sadly. It is a good weapon, though – it has 7 strength and 3 magic. If you decide to use it, you’ll gain access to the focus converter ability. Crystal Snow is a keyblade that looks like an icicle, you’ll have to LET IT SNOOOOOW, LET IT SNOOOW– sorry, you’ll have to complete the Arendelle level. If you equip it, you’ll get four strength and seven magic, and a skill called freeze protection. Wheel of Fate is a keyblade with a ship wheel at the top. Obviously. In order to unlock it, you’ll have to finish the Pirates of The Caribbean part of the story. Having it will give you the waterza ability, and a bonus of eight strength and five magic. Imagine a USB dongle that is also Bumblebee from the hit movie Terminator. This is that. You’ll get it after you complete the San Fransokyo chapter, and it’ll give you seven strength and five magic, as well as the stun protection ability. If you’ve already squeeze all the other Kingdom Hearts games dry, you’ll be familiar with this one. You can get it by beating the Keyblade Graveyard chapter. As for stats, it has four strength and four magic, and an ability called MP haste. If Winnie The Pooh went on a rampage to avenge the deaths of his friends, he would wield this weapon. Incidentally, you can get it by visiting the yellow bear in the 100 Acre Woods. You’ll need to find the secret entrance first, though. The Hunny Trenta has the Harvest ability, and it boosts your strength by six and your magic by five. The Grand Chef is a weapon that turns into a frying pan, and gives the wielder +5 strength and +7 magic, along with the wizard’s ruse ability. You can obtain it by getting an excellent rating on all meals. Hands down the best blade in the entire game, the Ultima Weapon can be crafted after you’ve collected all 58 synthesize materials. It has 13 strength and 13 magic, and unlocks 3 skills – air combo boost, situation boost and combo boost. There’s three of these. If you’ve preordered on Xbox, you get the Phantom Green. If you get the game early on PS4, you’ll end up with the Midnight Blue. If you preorder on Amazon, regardless of platform, you’ll get the Dawn Till Dusk. There’s also 1 for doing all the Classic Kingdom games. I’m not exactly sure if you need to get a high score in all of them or just collect all of them though. There’s another 1 you get by doing all the Ratatouille cooking mini-games. I think you need to get excellent in every single one, not 100% sure though. I don’t know of any more, just those 2.